Over the last year, humane leaders from around the world have called for changes at the Canidrome dog track in Macau. Thousands of people have written to the government asking them to create an adoption program to help the greyhounds, including Brooklyn. Additionally, animal protection groups like Animals Australia and Animals Asia have urged that the export of greyhounds from Australia to Macau be stopped. These efforts have led to an encouraging dialog between the Macau government, Canidrome management and local animal protection group ANIMA. However, despite these talks no real changes have yet occurred. I am a dog lover just like you. I love dogs because all they want to be is your friend. But the Greyhounds in Macau don’t even have a chance to show what good dogs they are because there is a law that prevents them from being adopted in Macau! And Hong Kong owners have to pay a lot in quarantine fees just to own one! There have been a lot of people like Grey2K, Global Animal and Animals Asia who have been asking the Macau government to stop since 2003. I heard that the government people said they would shut down the Canidrome in two or three years, but they have made promises before and that’s not soon enough! Max then asked readers to send an e-mail to the Australian Prime Minister and like the Stop Greyhound Racing in Macau Facebook page. Finally, he asked readers to join him last Saturday in Hong Kong for a sit-in with his dog Pepe. We have not yet received an update on Max's event, but I'm hopeful that it was well attended. Above all, his leadership should be applauded. 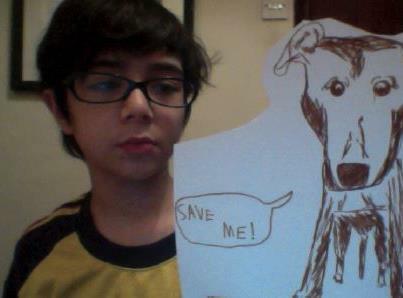 Max may only be eleven years old, but his compassionate voice is being echoed by people all around the globe.